Bhubaneswar, India:India and Belgium played out a thrilling draw to remain level on points at the top of Pool C on Day Five of the Odisha Hockey Men’s World Cup Bhubaneswar 2018. The 2-2 score-line leaves India at the top of the pool on goal difference ahead of the Red Lions, with everything to play for going into the final round of matches on 8th December. The Pool C action began when South Africa (FIH Hero World Ranking: 15) and Canada (WR:11), two teams who were defeated on the opening day of competition, went head-to-head. South Africa dominated the opening period of their match against the Canadians and would have been ahead were it not for wonderful save from shot-stopper and Odisha Player of the Match David Carter, who gloved an Austin Smith penalty corner drag-flick onto his own crossbar. The African champions continued their supremacy in the second period but came close to falling behind, with James Kirkpatrick being denied by a good block from Rassie Pieterse. Canada’s resistance was finally broken near the end of the third period thanks to Nqobile Ntuli, who moved past Carter before crashing a backhand shot into the unguarded net. It was a lead that lasted just two minutes, with Canada captain Scott Tupper firing a penalty stroke past goalkeeper Gowan Jones, who had replaced Pieterse at half time. Canada’s Red Caribou frustrated their opponents in the final stages, with South Africa replacing their goalkeeper with an outfield in an attempt to claim all three points and boost their hopes of getting out of the pool. However, it was not to be, with Canada claiming a share of the spoils while South Africa were left to rue their missed opportunities. A sensational atmosphere greeted the players of India (WR:5) and Belgium (WR3) as they walked out onto the turf at the Kalinga Hockey Stadium, with a sell-out 15,000 people packed into the venue to witness a key match in the race for a first place pool finish and the subsequent place in the quarter-finals that comes with it. The Red Lions had the best of the first quarter and got their reward eight minutes in, using a clever video referral to win a penalty corner that was clinically dispatched by Alexander Hendrickx. India had chances either side of the first quarter break, although a moment of inspiration from Tom Boon in the second quarter almost doubled the advantage when his improvised deflection hit the frame of the Indian goal. Much to the delight of the home crowd, India came out firing in the third quarter, piling pressure on the Rio 2016 Olympic silver medallists. Eventually the leveller arrived from the penalty spot, with a stroke being awarded after a goal-bound penalty corner effort hit the body of a Belgian player on the goal-line. Harmanpreet Singh proved to be the coolest man in the stadium, soaking up all the tension and channelling it into an effort that was hard and true, wrongfooting Belgium goalkeeper Vincent Vanasch to find the bottom left corner. 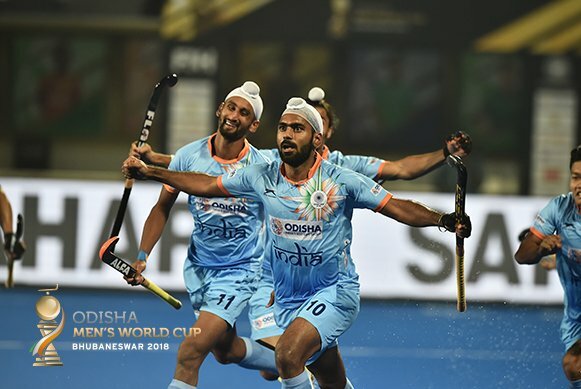 The Kalinga Stadium erupted two minutes into the fourth and final quarter when Simranjeet Singh scored his third goal of the competition from close range, putting India very much in the driving seat for that crucial first place finish in the pool. It proved to be temporary, with Belgium replacing their goalkeeper with an outfield player to turn up the heat on the home favourites. It paid off four minutes from the end when Simon Gougnard slapped home an equaliser after a decisive Belgium move ripped through the Indian defence to complete the scoring. The action continues on Monday 3rdof December with the second round of Pool A matches taking place. At 1700 IST (UTC +5.30), Spain (WR:8) and France (WR:20) will aim to recover from their respective opening day defeats and get some crucially important points on the board. That match is followed by a clash between two teams who were victorious in their first matches, with New Zealand (WR:9) facing Olympic champions Argentina (WR:2) at 1900.